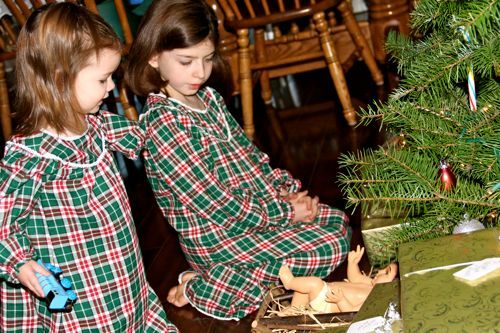 Sweet little girls in pretty new nightgowns, saying "Happy Birthday" to Baby Jesus on Christmas morning. The girls have been so happy to have another new home* (in addition to their Castle and Fairy Forest Lodge) for their Calico Critters! I knew that the girls would love their new Marie-Grace and Cecile Mini Dolls, but I had no idea that this bonnet, which Twinkle Toes also found in her stocking, would be such a hit... She has been wearing it practically ALL the time! I should have ordered one for Chiquita too! Your pictures are simply beautiful! 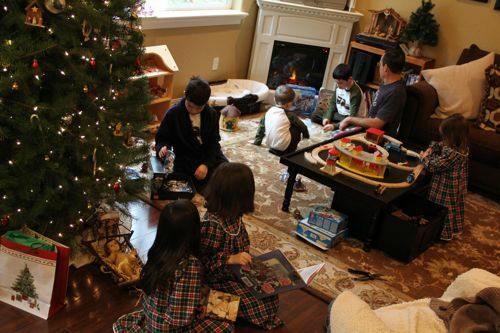 How ever did you manage to have such an uncluttered space on Christmas morning? No matter how much I scale back on Christmas gifts, our family room always looks like someone bombed the room on Christmas morning. Of course, I can't control what others buy so that may be part of the issue. 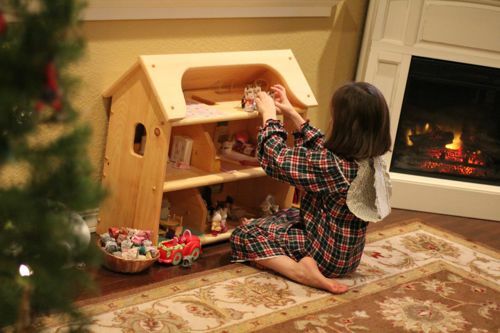 thanks for sharing your beautiful Christmas blessings. Sweet and wonderful...It is so strange that I have no idea where you live or really much about you. However, I feel close to your family through what you share on this blog. Thanks for sharing. Oh, the bonnet! 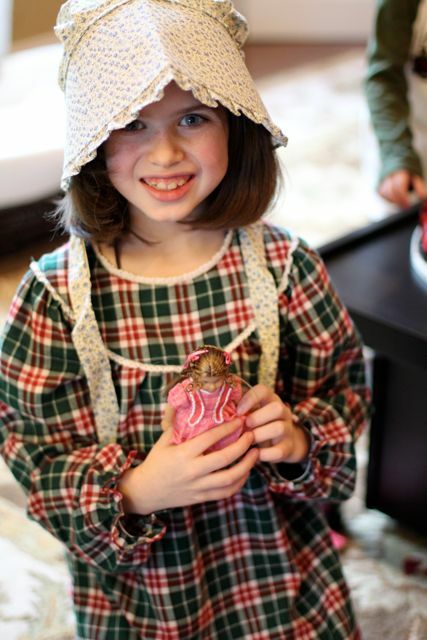 Our daughter received one as a gift for her birthday and is still thrilled to be able to play "Little House on the Prairie"! So precious! Loved your pictures of Christmas. I didn't feel so bad about our 4 AM bedtime on Christmas morning. Thanks for all the inspiration for the holiday season; I enjoyed reading and gathering up ideas! How nice that she loves the bonnet! It looks real cute.